Mark Karpelès is the former CEO of Mt. Gox, the world's first bitcoin exchange. He currently works as chief technology officer of London Trust Media, a Denver-based company that runs a paid virtual private network (VPN) service. Karpelès was born in Chenôve, France in 1985. He attended Chevreul primary school in Dijon, where he grew to love computers and programming. He has worked as a programmer and executive for a number of companies in France, Japan, and the U.S., including Mt. Gox. Karpelès acquired Mt. Gox, the world's first bitcoin exchange, from Jed McCaleb in 2011. McCaleb had originally set the site up as a trading platform for cards from the "Magic: The Gathering" card game, but decided to convert it into a bitcoin exchange in 2010. Karpelès, an avid programmer, began rewriting the site's software. In 2011, Mt. Gox was hacked, causing the exchange to go offline for several days. Notable bitcoin enthusiasts Roger Ver and Jesse Powell worked with Karpelès to help the site recover. They noted that Karpelès' behavior was unusually calm, given the nature of the crisis. The site was hacked again in 2013 in the midst of legal battles with the U.S. government and former business partner Coinlab. According to Powell, Karpelès still seemed oddly unpreturbed about the hack, which involved millions of dollars worth of Mt. Gox users' bitcoins being lost. On Saturday, August 1, 2015 Karpelès was arrested by the Japanese police and charged with manipulating Mt. Gox's records in order to increase the balance of a certain account. After almost a year in prison, he went to trial in Tokyo for embezzlement and manipulating corporate records. Because Karpelès is still the majority shareholder of Mt. Gox, the majority of its assets, once liquidated, would have gone to him. However, in June 2018, the Tokyo District Court began a process called "civil rehabilitation," which involves converting non-monetary assets (in this case, bitcoin) to fiat currency, to be given back to the customers whose bitcoins were lost - not to Karpelès. He has said publicly that he does not want Mt. Gox's remaining bitcoins. In 2018, Karpelès told Fortune Magazine that he had begun employment with London Trust Media, a company based in the U.S., as its chief technology officer. He said he is less interested in cryptocurrency now, and wants to avoid getting into more trouble than he is currently in. In December 2018, prosecutors at the Tokyo District Court sought a 10-year sentence for Karpelès. According to the report filed by the prosecutors, Karpelès "diverted company funds to such uses as investing in a software development business for personal interest" and "played a great role in totally destroying the confidence of bitcoin users." In February 2019, Karpelès was refused a motion to stay a U.S. court case "in light of ongoing civil rehabilitation proceedings in Japan that are likely to provide full recovery" to plaintiffs Gregory Greene and Anthony Motto, two former customers of Mt. Gox who are holding Karpelès "personally liable" for losses incurred by investing in Mt. Gox. The Northern District of Illinois judge Gary Feinerman denied the motion. Following the denial, a status hearing was scheduled for May 1, 2019. On March 15, 2019, Karpelès won a not-guilty verdict on the charges of embezzlement and aggravated breach of trust. His sentence was suspended for four years, although he was found guilty of falsifying electronic records by a Japanese court. He was sentenced to two and a half years in prison, but his sentence will not be carried out for four years, provided he maintains "good behavior." ↑ Ex-CEO of Bankrupt Bitcoin Exchange Mt. Gox Has a New Job in Crypto. Fortune. ↑ The Côte d'Or genius that shakes the net. Le Journal de Saône et Loire. ↑ THE INSIDE STORY OF MT. GOX, BITCOIN'S $460 MILLION DISASTER. Wired. ↑ Japanese Police Arrest Mark Karpelès of Collapsed Bitcoin Exchange Mt. Gox. The Wall Street Journal. ↑ Mt. Gox Ex-CEO Karpeles Says He ‘Doesn’t Want’ Leftover $1 Bln Post-Liquidation Funds. Cointelegraph. ↑ Top Latest Japan World Business Sports Entertainment Opinion Lifestyle Features Photos Videos 10 yrs sought for bitcoin exchange MtGox's ex-CEO over embezzlement. The Mainichi. ↑ 10-Year Jail Term Sought for Former Mt Gox CEO Mark Karpeles. Coindesk. ↑ Mark Karpeles Fails to Halt US Court Case Over Mt Gox Losses. Coindesk. ↑ Former Mt. Gox Bitcoin Bigwig Unlikely to Do More Jail Time After Beating Embezzlement Charges. The Wall Street Journal. 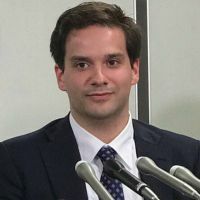 ↑ Japan court sentences Mt Gox chief executive Mark Karpelès. Financial Times.